I was given this photograph many years ago, accompanied by a sheet of greenish paper with a typewritten story on it. It happened when the Internet was probably not yet invented. During Easter 1998, it came to my mind that I share it with you. This story describes how a very special photograph of the Risen Christ was manifested by Sri Sathya Sai Baba for a visitor to one of his ashrams known as Prasanthi Nilayam - which means the Abode of Peace - in Puttaparti, India, in 1985. I relay the details to you as they were conveyed to me by Barbara McAlley, a friend who I met 'quite by chance' amongst a throng of people at Bombay airport in July 1987. We established an immediate rapport, both being English, although she had been living in New Zealand for the past twenty years. When Barbara first showed me this wondrous photograph of the Risen Christ in our hotel room in Bombay, I couldn't wait to hear her story of how it had come into being, knowing it was more than just a coincidence that we had met. Barbara had been a devotee of Sathya Sai Baba, who many people feel is the Avatar of this Age, for a number of years. Now she was just returning from her second visit to see him. She was carrying this photograph of the Risen Christ with her not only because it had originated in Puttaparti in the first place but also because she always took the picture with her when she travelled. In 1985 Barbara had gone to Puttaparti with a friend from New Zealand. 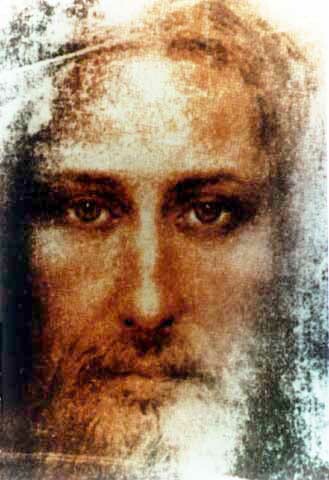 Her friends who at the time was very much caught up with all the suffering of Christ, had with her two items which she hoped Sai Baba would bless for her - a crucifix and a black and white photograph of a computer printout of the image of Christ taken from the Turin Shroud. Daily they had attended darshan, a Sanskrit word meaning the devotional seeing and gazing upon (as a blessing) of the Master, in order that they might sit at the feet of their Lord.